Mother Cow is the queen in the pantheon of sacred Indian animals. In fact, she stands head and shoulders above the rest. 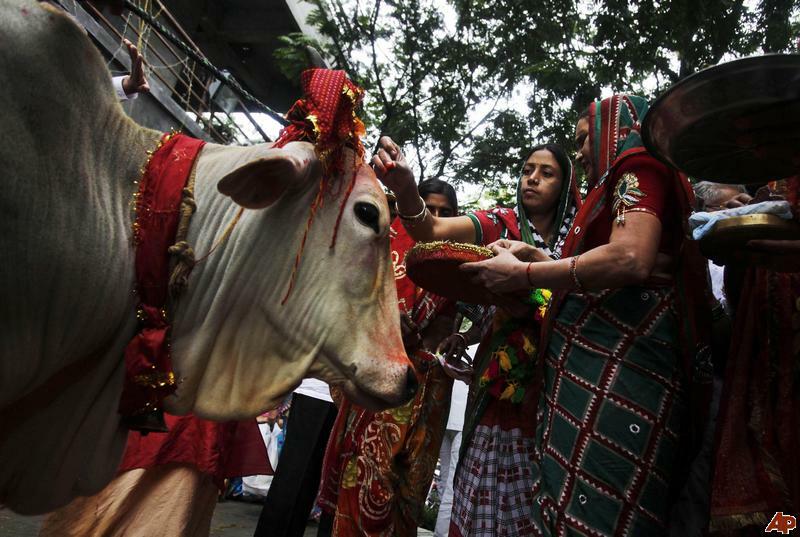 There are group all over Indian demanding the government name the cow as the national animal to replace the tiger which currently holds that honor. You might wonder how this all came about. Many years before the pyramids were built in ancient Egypt, or written law chiseled into stone by Hammurabi, or paper invited by the Chinese, the Indian people had given up their nomadic wanderings. They had settled down to an agricultural lifestyle. This was before coins were used as money, and wealth was determined by the number of cows owned by the farmer. Cattle became legal tender and were used as payments, presented as dowry, and even used to pay the hated taxes! Through the ages, cow’s milk has been often the only source of nourishment for India’s vast population. 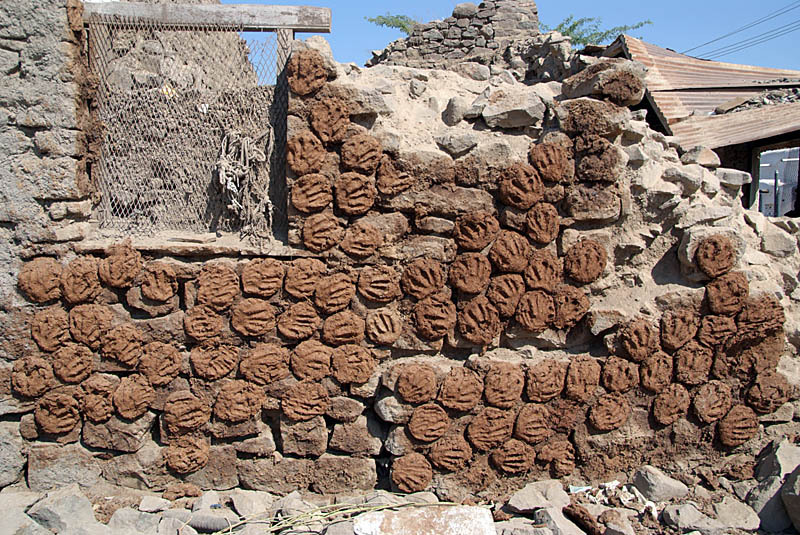 Another gift from the cattle is the dung which is still used in construction of rural homes and as insulation on walls, and as tiles for the floors. 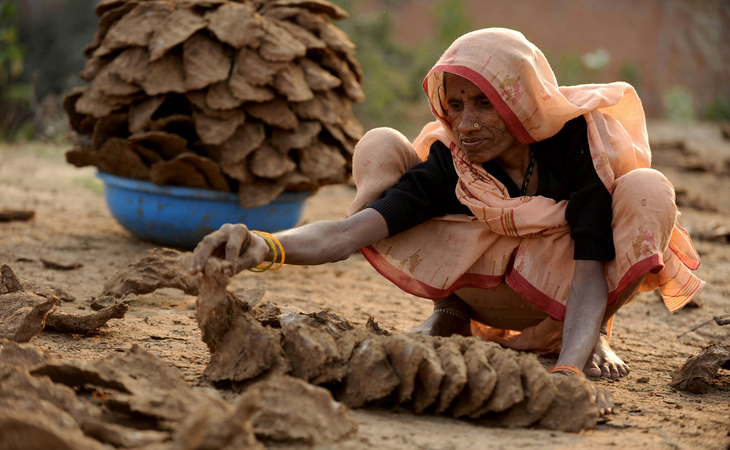 The cow pies are burned in the cold weather and used for cooking as the only source of fuel for the Indian village dwellers. When the cows stop producing milk, they are abandoned by the farmers because they are of no use anymore and can not be taken to the slaughter house. This is why they are cows strolling through the the chaotic city traffic serenely ignoring the madness all around them instead of grazing in a village field. 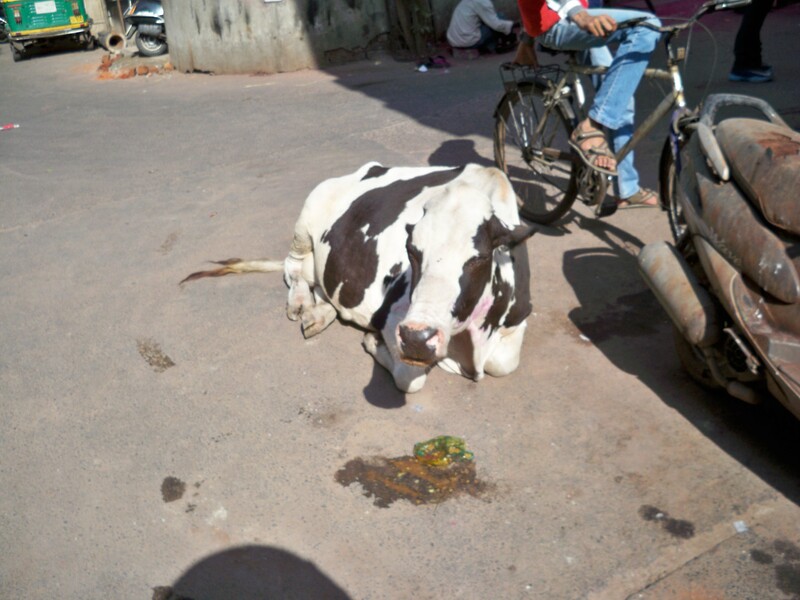 Recent studies have concluded that Indian cows hang around on busy streets because the prolific exhaust fumes discourage flies which torture the bovines. Another perk for the cows are that the toxins in the fumes make them high. They often do appear very relaxed! So the chaos they can cause stopping traffic and generally being in the way is quite a good place for them ! 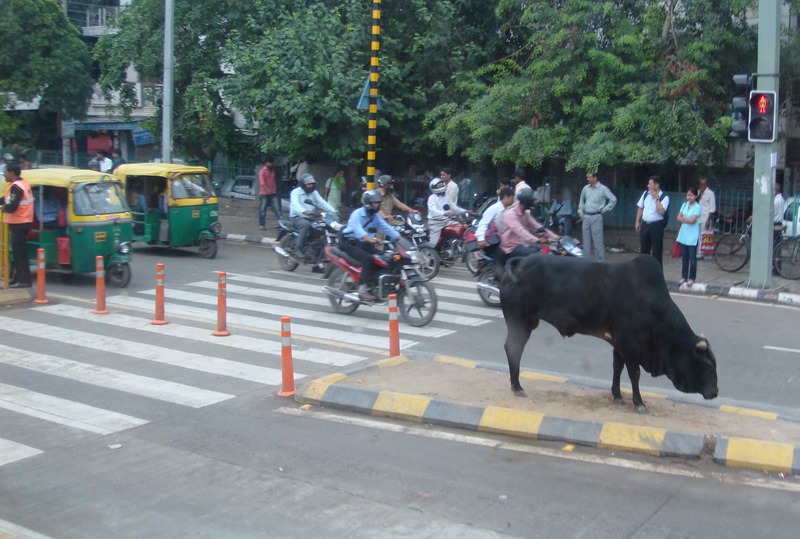 Pedestrians in India have to look right, left, right while crossing the crowded streets to avoid being hit by cars, rickshaws, camel pulled carts, motor bikes, pedal bikes, as well as glance down to avoid stepping in fresh cow dung. We were told it was a “blessing” from the cow if we walked through the dung. 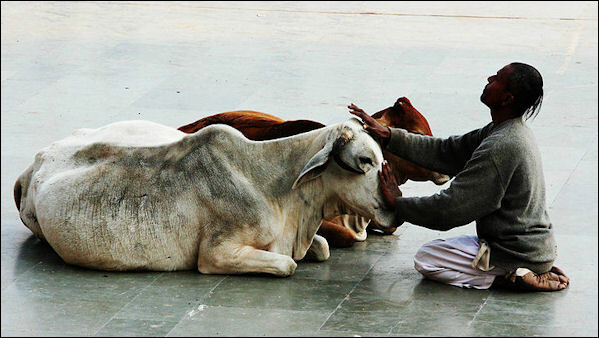 Though, we all loved getting blessings on our foreheads, we eagerly avoided the “foot blessing!” Holy cow! Namaste. . . . . . .This is incredible India! 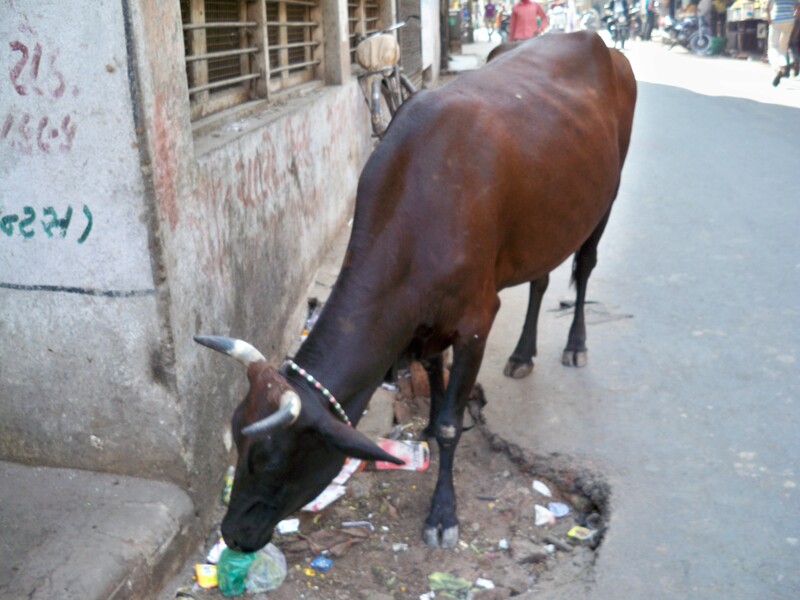 This entry was posted in India, Uncategorized and tagged city, dung, holy cow, India, milk, photographs, rural villages, travel. Bookmark the permalink. Up in Ludhiana in the Punjab the cows are housed in religious old age homes called “Go Shallas” which are attached to temples. On our visits we often go to these and make a monetary offering and feed the cows. These cows are treated much better than India’s poor! I have always wondered about this. Thanks. Very informative post and the photos are wonderful. Take care. Great perspective on “Holy Cow!” Love the milking lady and her smile. It is a fun one! Yup liked it, and only just now properly read the title, which has a double meaning for Americans …. clever ! I will be on the look-out! Good for you ….get some rest! Thanks for the reblog and the lovely gift to me today! Always a pleasure … for some reason I always want to call you annabell, but have to slap my own hand to stop myself from typing it … is that normal or am I the only one ? I haven’t heart that from a blogger but have been called that. Funny thing is that my maternal grand-mama was Annabell…so I could have been ,too. So no problem at all! Well you’ll know if I ever call you that in the future, what has happened ! In case I have forgotten by then, remind me please! LOL, that’s the point, if I call you annabell then it’ll be because my brain working faster than my fingers … it may be you that’ll have to remind me ! I am ever so glad. Thank you ! Namaste. . .
You are welcome, anytime! Namaste. . . .
Love this Don. So glad you introduced me to this link. I’m now a convert and a follower. She’s amazing. LOL…I am very happy that you do, Angie….I owe good old Don…for sure for all these awesome new friends! I owe him also Annet. He designed my beautiful logo, and introduced me to you. What a great guy! Terrific friend! I used to pat cows heads as We strolled down the street and I loved the dogs! Many of my pictures are from Google images Public Domain. My friend, I love INCREDIBLE India. . . .if you have time, check my blogs ! Smiles. . . . .
Another favorite! What a trip to walk down the street with one or these beauties! Ha, I love the article.